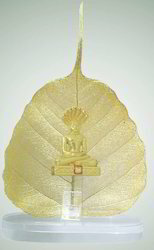 We are leading manufacturer of Gold Plated Statue on Leaf. Made of pure 24 K gold is our another range of unique and special product treated and coated with 24 Karat gold. 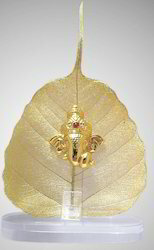 Ganesha Gold Plated Statue On Leaves is designed and coated in a way to keep the leaf veins matrix intact. 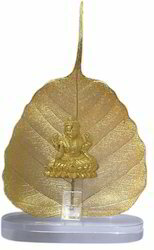 This gold natural pipal leaf is used for gifting purpose in all occasions with the following features. 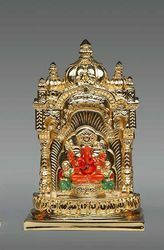 Within the short time period, we are engaged in presenting an excellent grade of Parshwanath Gold Plated Statue On Peepal Leaves. This leave is highly recognized among the clients as it is suitable to install in various health, mind and finance related issues. The offered leave is developed utilizing powerful mantras and enchants. The mantras are operated under the proper guidance of our adroit professionals. Additionally, this leave can be purchased from us in several shapes, size and designs within promised time frame. We are successfully ranked amongst the trustworthy entities offering a wide range of Gold Plated Ganesha Statue on Pipal Leaves. These leaves are highly recognized among the clients as it helps boost the finance. People looking for good money and fortune can prefer using the leaves at home or office. The offered leaves are developed using quality materials such as gold and silver. Further, the leaves are made powerful after enchants. The mantras are operated under the proper guidance of our adroit professionals. Owing to the expertise of our team of experienced professionals, we are able to introduce an exclusive range of Gold Plated Mahalaxmi Statue on Pipal Leaves. The offered leaves are developed using quality gold, silver and other materials. These leaves are made powerful after applying mantras or panchakshar mantra. Further, the mantras are operated under the proper guidance of our adroit professionals. Apart from it, clients can get the leaves from us at industry leading rates.